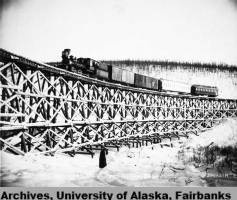 Tanana Valley Railroad, Bridge No. 5, Fox Gulch, Alaska, circa 1910. Photo by Albert J. Johnson. UAF-1979-41-67, Falcon Joslin Papers, University of Alaska Fairbanks Archives. This website is designed to teach Alaskan high school students about their state, its rich history and its people. The curriculum is designed to meet Alaska’s Alaska History graduation requirement and related performance standards. The Alaska Humanities Forum and the state’s leading historians, anthropologists, geographers and educators developed the course. This website provides materials about Alaska Native history, education, languages and cultures for teachers, students and anyone interested in Alaska’s first people. It was developed from 1998-2004 by the Alaska Native Curriculum and Teacher Development Project (ANCTD) at the Institute of Social and Economic Research, University of Alaska Anchorage. The project brought together teams of teachers, elders, and community members in various parts of Alaska with university-based specialists to develop curricula on Alaska Native studies and language that would be available to all schools through the internet or on CD. This website serves as a resource for compiling and exchanging information related to Alaska Native knowledge systems and ways of knowing. It has been established to assist Native people, government agencies, educators and the general public in gaining access to the knowledge base that Alaska Natives have acquired through cumulative experience over millennia. This website focuses on inspiring learning and building community through narrative, and using storytelling as a window to literacy, cultural diversity and life in Alaska. As an on-line learning tool, LitSite Alaska showcases a living archive of lesson plans used in Alaskan classrooms and an extensive collection of excellent peer work by Alaskan students. It also includes a useful interactive timeline of Alaska’s history. This website includes historical and cultural information about Alaska’s national parks. It includes information for teachers and kids, and ways to explore history. It also has material about archeology, ethnography, collections, and publications. This website provides information for teachers about what the National Park Service has to offer in terms of distance learning, field trips, curriculum materials, and accredited professional development opportunities in national parks throughout the country. This site is not Alaska specific. This website contains oral history interviews with people involved in different aspects of the 1989 Exxon Valdez Oil Spill disaster as well as links to additional resources. The project was done in conjunction with the Prince William Sound Regional Citizens’ Advisory Council. FAQs, Links, and Unique Resources at ARLIS is a guide to the collection of materials on the Exxon Valdez Oil Spill (EVOS) that the Exxon Valdez Oil Spill Trustee Council (EVOSTC) has entrusted to ARLIS, as well as materials representing diverse perspectives from state and federal agencies, universities, the private sector, the media, and the general public. Topics include the grounding of the tanker, oil spill response, cleanup, damage assessment, impacts to the environment and people, research, and restoration. The collection contains books, reports, maps, photos, documentary films, video footage, and data, in print and digital formats. ARLIS even has works of poetry, novels, children’s books, a theatrical play, and a made-for-TV movie, all pertaining to EVOS. This guide provides links to numerous full-text publications and many more are available full-text through the ARLIS catalog. Exxon Valdez Oil Spill: Resources for Teachers and Students is a bibliography of books, videos, websites, and articles pertaining to the Exxon Valdez oil spill and related topics of interest to teachers, students of all ages, and the general public that are available at ARLIS. The Alaska Digital Archives website contains digital photographs from the 1989 Exxon Valdez Oil Spill disaster and cleanup that are housed in the collections at the Alaska State Library – Historical Collections and the Alaska State Archives . The Spill: Personal Stories from the Exxon Valdez Disaster by Stan Jones and Sharon Bushell (Kenmore, WA: Epicenter Press, 2009). Published for the twentieth anniversary of the oil spill, this book features interviews with over 60 people who experienced the spill first-hand, including Alaska citizens; government agency personnel involved with the spill and cleanup; elected officials who dealt with the spill; and oil industry personnel involved in the spill and cleanup. Red Light to Starboard: Recalling the Exxon Valdez Disaster by Angela Day (Pullman, WA: Washington State University Press, 2014) Published for the twentieth-fifth anniversary of the oil spill, this book details the genesis of the disaster and examines the lingering effects, including incomplete cleanup of oil, declines in marine populations, and the adequacy of reparations to those effected. With the website, UAA’s library provides a single location for researchers looking for primary source material about the earthquake, including photographs, books, documents, and oral histories. It represents a variety of libraries, archives, museums and other organizations around Alaska that have earthquake material in their holdings. This is part of larger website of the Alaska Earthquake Information Center, Geophysical Institute, University of Alaska Fairbanks. It contains general information and description of events related to the 1964 Earthquake and the tsunami that followed. This website provides historical information, photos and videos about the 1964 Earthquake and anniversary events. It also provides useful links to other resources. This website provides scientific information about earthquakes and earthquake preparedness. It also contains film footage of the 1964 Earthquake. The Alaska Earthquake Alliance is composed of member groups and organizations, and coordinates earthquake awareness and preparedness activities in Alaska. The Alliance is a part of a statewide alliance linking organizations and individuals that provide earthquake information, services, and who desire to improve on earthquake preparedness and awareness. The Alaska State Archives provides access to the digitized collection of approximately 220 hours of audio of all plenary sessions and most meetings of the Committee of the Whole during the Alaska Constitutional Convention held at the University of Alaska, Fairbanks from Nov. 8th, 1955 until Feb. 6th, 1956. These recordings are presented day by day, tape by tape, with links to the corresponding day’s transcript. A teachers guide to using the recordings of the Alaska Alaska Constitutional Convention held at the University of Alaska, Fairbanks from Nov. 8th, 1955 until Feb. 6th, 1956. The material is organized thematically and includes audio excerpts and topics for discussion in a classroom setting. Also includes links to, downloads of, and a bibliography of other resources related to the Alaska constitution. This project was done by the University of Alaska from 2003 to 2006 to research and commemorate the fiftieth anniversaries of Alaska’s Constitutional Convention and the granting of statehood. Through a documentary series, an interactive multimedia website, teacher education programs, university courses and public symposia, Creating Alaska was designed to help give present and future generations a better understanding of the creation of the great State of Alaska. This film was produced by KUAC TV Fairbanks as part of the University of Alaska’s Creating Alaska project. This is the Teacher’s Guide in the Alaska History and Cultural Studies online curriculum developed specifically to complement the video. Also includes a way to play parts of the video. The video can also be ordered directly from KUAC. The National Park Service’s website for the Aleutian Island’s historic district that includes information about the story of World War II in Alaska. The site includes interviews with veterans, stories about the lost villages of the Native Aleut people of the Aleutian Islands, and diaries, memoirs and stories of the war. This website was developed by the Alaska Rich Mining Project Committee to make archival, library and museum materials related to the history of the gold rush in Alaska more accessible to users throughout the state and to assist teachers in using primary source materials in classrooms. This website is a bilingual, multimedia English-Russian digital library that tells the story of the American exploration and settlement of the West, the parallel exploration and settlement of Siberia and the Russian Far East, and the meeting of the Russian-American frontier in Alaska and the Pacific Northwest. It is intended for use in U.S. and Russian schools and libraries and by the general public in both countries. The site provides an overview of the historical experience of the frontier in Russia and America through six narrative sections, each of which includes images that illustrate major events and themes, a bibliography with suggestions for further reading, and links to other web sites with related content. Also, within each narrative section there are several more detailed modules that contain more images and additional explanatory text. The site also contains complete or substantial parts of many collections that have been selected for digitizing because of their relevance to the American West and Siberia and the Russian Far East.